It seems like everyone's been waiting for the iOS version of Waze, the social GPS and traffic app, to become AppRadio compatible. Well, officially it isn't compatible yet, in the sense that there isn't a special AppRadio interface for the app but it does work to a certain extent with the in-dash receiver. Since the app isn't fully compatible with the AppRadio it doesn't show up in the 'Compatible Apps' list. So after clicking on the 'Apps' icon on the AppRadio 2 (should be similar with AppRadio), you have to launch the app manually from your iPhone. This brings up the 'Ignore' warning on the AppRadio 2. 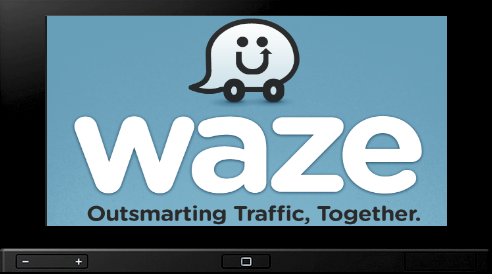 After getting through that, Waze shows up on the screen. If your phone is in portrait mode the Waze interface displayed on the AppRadio 2 is all stretched out. You have to put the phone in landscape mode for the Waze interface to do the same. This is hard to do if you have your phone in a non-rotating car holder. I get around this by putting the phone in landscape mode and then turning on the screen rotation lock. 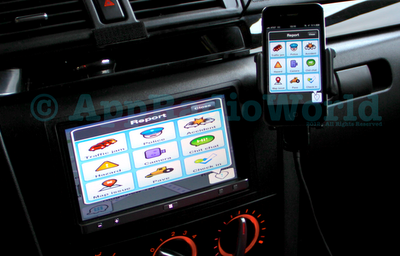 What really happens is that the Waze interface on the iPhone just gets mirrored on the AppRadio 2. So you can't use the AppRadio 2 screen to control the app. All commands need to be input on the iPhone. Trying to click anywhere on the AppRadio 2 screen brings up that red colored 'X' in the top right corner, indicating that touch commands are not available. And, as with any other app that uses the AppRadio screen as an external display, trying to switch between apps isn't possible because it almost always brings up that blank screen on the AppRadio. You then have to quit and close the app on the iPhone and restart it for it to show up externally again. Waze does have gesture commands though. You can either do a three-finger click on the iPhone or simply wave your hand over it to bring up the voice commands. Here you can report traffic, an accident, a police car etc. by just speaking the respective command. This is a well thought out feature and I've used it a few times. Even though Waze isn't technically AppRadio compatible yet, using the bigger screen of the AppRadio as an external display is better than trying to squint to look at the iPhone while driving. Hopefully the developers of Waze will work on a dedicated AppRadio interface for their app sometime soon. Until then the mirroring feature will do, I guess. There is a function in the waze settings menu which is visible when you connect the phone to the appradio and activates the touch commands on the appradio!! !